Home › Travels › Asia Pacific › Thailand › Phuket › LA CASA MI CASA! Yummy yummy in my tummy! Le Casa is an italian restaurant that we found while vacationing in Phuket, in a mall called Jungceylon Mall. Why we ate Italian in Thailand you may ask? Well, as good Canadian boys we were craving for a good pizza so when we saw this restaurant advertising various pizzas, we were sold! I’ll be honest, I was visiting their website while writing this post in hopes of getting more information, but their website is not really that user friendly. I actually think this is an American company, since the contact us section has Milwaukee as their address. Anyways, back to the food shall we. I am a big fan of any dish that has tomato sauce in it (i love to drink Tomato juice by the way) so that is probably why I was in love with this dish. 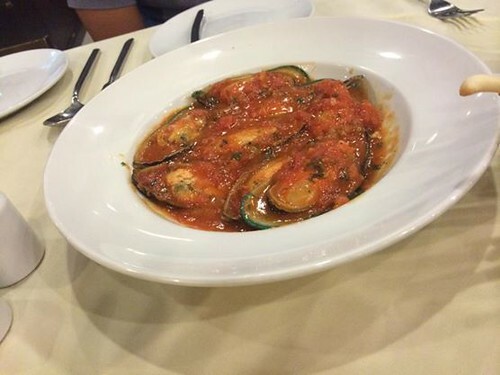 The mussels were very fresh, and the tomato sauce had a hint of spiciness in it which added an extra zing to my taste buds. Loved it! Another good thing about this restaurant, was that we got free wifi. Lol we sat here for a couple of hours drinking beer until it was time to party it up in Bangla Road!! PS – more to come on that later! Oh my, they both looks so delicious! It was good 🙂 love pizza.